Protests at the Brandenburg Gate, in Berlin, against the US withdrawal from the Paris climate change deal. The G20 is crucial to international action on climate change. Together, member states account for 75% of global greenhouse gas emissions and, in 2014, accounted for about 82% of global energy-related carbon dioxide emissions. 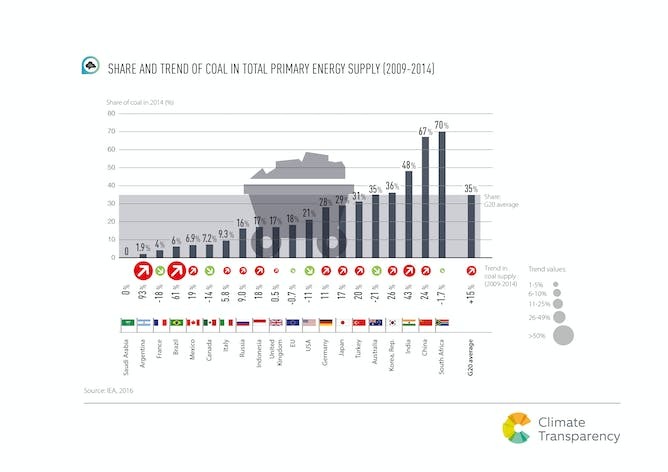 Coal power remains an important source of energy in some G20 countries. There is good news, though: renewable energy is on the rise. The G20 countries are already home to 98% of all installed wind power capacity in the world, 97% of solar power and 93% of electric vehicles. In most G20 countries, renewables are a growing segment of the electricity supply, except in Russia, where absolute renewable energy consumption has decreased by 20% since 2009. China, the Republic of Korea and the UK have all seen strong growth.